This Is The Time Of Your Life. Enjoy It! Nestled in the foothills of the breathtaking Blue Ridge Mountains, White Oak Village is conveniently located in the quaint town of Tryon. 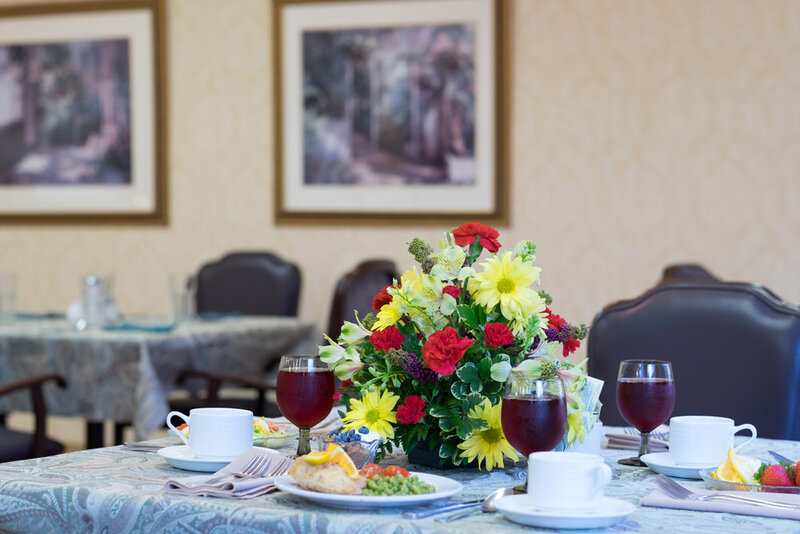 One and two bedroom independent living apartments are available, as well as assisted living, skilled nursing and short-term rehab so residents can feel secure in the fact that further assistance is there if ever needed. The medical care in this area is of the highest caliber. St. Luke’s Hospital is located minutes away and Tryon boasts a wide range of medical specialists who are noted as leaders in their field. This unique area of North Carolina, fondly known as “horse country” is home to a variety of annual events such as the Block House Steeple Chase, the official North Carolina Barbecue Festival, and The Apple Festival. Tryon is also renowned for it's cultural events, art galleries, music festivals, fly fishing, hiking, and kayaking. Outings to local restaurants, walking downtown to enjoy shops and galleries, golfing, or just enjoying a day outside on the newly renovated White Oak patio are part of everyday life in the Village. Organized day trips may include visiting Biltmore Estate in Asheville, a tour of a local winery, or a shopping trip to a nearby premier outlet mall. White Oak Village is a vibrant, exciting community where friends are plentiful, responsibilities are few and boredom is never an option! We offer both 1 and 2 bedroom options at White Oak Village. Click below to view the layouts. Compare the cost of living in an apartment at White Oak Village with your current living costs. Rita has worked in the health care industry for over 30 years. She enjoys listening to future residents during the interview process for their wants when moving into a community setting. She is then able to guide her staff to make sure each realistic need is met socially, mentally, and physically. When prospective Residents tour our community they leave White Oak Village Retirement Community with a heightened sense of community in wanting to calling it Home. The past five years Rita has enjoyed working with our Residents in their active lifestyles. From zip-lining to wine & cheese socials to overnight excursions to wellness programs to painting classes to plays to vespers to meet the needs of each Resident at White Oak Village Retirement Community.